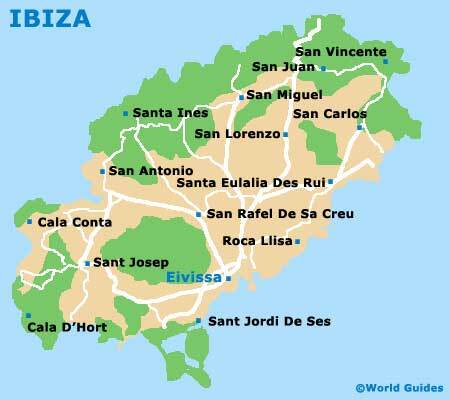 A glorious Mediterranean island boasting many centuries of history, those looking for a little culture on Ibiza will likely be drawn to its many old landmarks and buildings, which offer a real taster of the past. The historic area of Dalt Vila has actually been classed as a World Heritage site due to its numerous old buildings and general historic significance. Various monuments are distributed around the island, recognising the importance and achievements of individuals with strong associations with Ibiza, such as both Christopher Columbus and Paseo Vara de Rey, as well as the resident pirates of the 18th century. There are also ancient walls and arches, and a towering statue of Jesus Christ, as well as a spreading necropolis. This imposing landmark honours the famous explorer, Christopher Columbus. The monument is easy to locate, since it stands in the middle of a roundabout in San Antonio, where it was erected in 1992. Sited within the island's harbour, the Monumento a los Corsarios dates back to the early 20th century and pays tribute to the pirates who once defended the island of Ibiza from the sea during the 18th century. The tall obelisk faces the port and features in the San Salvador celebrations held annually during the month of August. 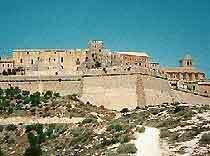 The Murallas are the city walls of Ibiza and are exceptionally well-preserved. Classed as a World Heritage site, the walls come with no less than eight bastions, as well as several main gates, including the Portal de Mar (Sea Gate). Visitors will also discover Roman statues and spectacular views over the harbour, which on a fine day, stretch as far as the nearby island of Formentera. Situated in the S'Eixample area of Ibiza, the monument to General Vara de Rey is a widely recognised sight on the island. The statue was created over 100 years ago,and stands proudly on the Paseo Vara de Rey, a prominent local street named after the general himself, who was actually born here in 1840 and sadly perished in Cuba during the war of 1898. 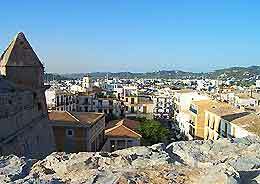 San Ciriaco is an interesting cobblestone street leading to Ibiza's impressive cathedral and is set in the historic area of Dalt Vila. The Capilla de San Ciriaco is actually a small opening in the rock and it is believed that this is where the conquest of the island was started in the early part of the 13th century. The sizeable Statue of Christ is a major landmark and was constructed shortly after the Spanish Civil War, being located between San Antonio and Ibiza Town. This monument was officially inaugurated in 1947 and from the base you will be greeted with some breathtaking views of the nearby valley. The statue depicts Christ with his hands reaching out, standing atop a tall pedestal, with the total height measuring in at approximately 23 metres / 75 feet. A large and ancient cemetery dating back many hundreds of years, the Necrópolis Púnica del Puig des Molins remains well preserved and full of surprises. This vast necropolis is one of the best examples of its kind in the whole of the Mediterranean and is located within the island's Puig des Molins area.